The National Headquarters for the SUVCW is housed at the National Civil War Museum in Harrisburg, Pennsylvania. The formation of the museum itself was largely through the organization and efforts of the SUVCW. On November 3, 1995, Commander-in-Chief David R. Medert and his Special Committee on the National Headquarters met with Mr. Stephen Reed, mayor of the City of Harrisburg, Pennsylvania. The committee consisted of JVC-in-C Richard Orr (chair), PC-in-C Elmer Atkinson, PA DC George Powell and Br. Glenn Knight, chair of the Nat. HQ Staffing Committee During their visit, they viewed the proposed location of the National Civil War Museum. The mayor proposed 750 square feet of office space, a similar amount of storage space lease for 10 years, use of museum conference facilities, parking for staff and use of the adjoining fields for National SVR musters. Construction of the museum was to begin in Spring 1996 with occupation expected in Summer 1998. The 1996 National SUVCW Encampment, held in Columbus, Ohio, endorsed the committee’s recommendation that this proposal and location be accepted. Almost a year earlier, C-in-C Keith Harrison had appointed a Special Nat. HQ Funding Committee, chaired by PDC Ivan Franz, Sr. and staffed by Clyde Hayner, Sr. and Stephen Killian. In its report the following year, the committee reviewed how our Order had coped without a headquarters and conducted a survey of how other Orders had each funded and staffed their own National Headquarters, and proposed locations for an SUVCW headquarters. In the end, the committee raised more questions than it answered, focusing on how best to fund such a venture. In 1995, the Special Nat. HQ Funding Committee, chaired by PC-in-C Gordon Bury, stressed the need for defining goals, terms and conditions, and financial responsibilities. The 1996 National Encampment did not concur with the committee’s fund raising recommendations. Meanwhile, the Special Nat. Headquarters Staffing Committee, chaired by Glenn Knight in 1995 and by Dr. David Martin in 1996, refined a list of duties that a new National Headquarters Executive director might undertake. Legal issues delayed the construction of the museum, but our Order moved forward with the hiring of an Executive Director. The 1999 National Encampment, held in Indianapolis, approved an increase to the National per capita, which, among other things, supported general fund expenditures, including a National Headquarters and the Executive Director’s salary. In November 1999, the SUVCW began accepting proposals from qualified individuals for the fee for services contractual position of Executive Director/Executive Secretary. The National Civil War Museum was finally built and opened in November 2000. C-in-C Danny Wheeler signed the contract in June 2000 and occupation occurred the first week in December. The Council of Administration named the SUVCW’s first Executive Director, who started August 20th, 2000. A second Executive Director was named on November 20th. Lee F. Walters, held the position from November 20, 2001 until September 30, 2008. He quickly set up the National Headquarters office at the museum. 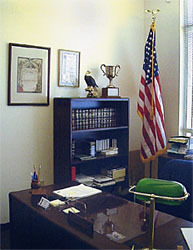 The National Order purchased new office furniture and file cabinets.